In just two days, the storm dumped 63 inches of snow—nearly half of the area’s annual volume. The localized blizzard may have dampened some Christmas cheer, but a team effort from airport personnel, police officers, airline employees, rental car companies and even folks from a neighboring airport helped operations resume in about two days. 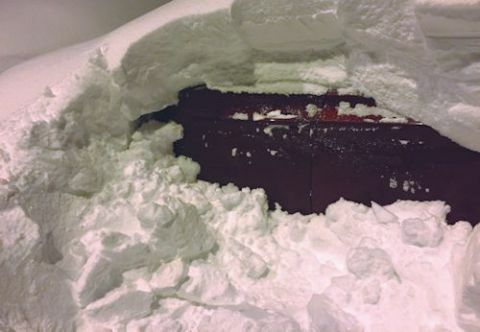 The massive snowfall wasn’t a complete surprise to airport personnel. Crew Chief Chris Karotko still has a screenshot from his phone’s weather app, which forecasted up to 32 inches of lake-effect snow with winds reaching up to 45 mph. Though off by a factor of nearly 100%, even that amount would have proved daunting; so Karotko had second-shift personnel stick around to help clear the airfield and keep traffic landing and taking off. Then it started to snow, and it just didn’t stop. ERI officials soon shut down the main runway; and by 10 a.m. on Christmas, the entire airport was closed. According to Executive Director George Doughty, heavy snow accumulation was a factor in shutting down operations. However, the main reason was the blinding conditions, which forced managers to suspend snow removal efforts for the safety of their crews. In total, 13 inbound and 13 outbound flights were cancelled, and a few passengers had to seek shelter in the airport until conditions improved. Most passengers, however, managed to find their way to nearby lodging or stayed with friends and family in town. After conditions cleared up a bit, maintenance crews started working to remove snow from the airfield and relocate it off the runways. ERI’s fleet includes two large multi-function vehicles from MB Companies that plow and broom pavement at the same time; two high-speed blowers; two plows and a broom vehicle. The airport also has two single-function plows and a broom vehicle. However, one blower broke down in the middle of the cleanup operation. Fortunately, nearby Pittsburgh International Airport (PIT) came to the rescue. After ERI’s blower stopped working, PIT not only sent one of its own blowers to replace it, it also sent a crew to train ERI’s people how to operate it. Moreover, the crew remained on standby in case ERI needed additional manpower. After clearing away the bulk of snow, crews also focused on making the runways and taxiways usable. 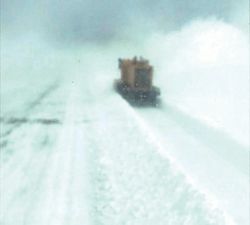 Multi-purpose vehicles spread sand as they plowed, and a separate piece of equipment sprayed deicing fluid to prepare the pavement for aircraft. Despite the deluge of snow, ERI only sustained minimal damage to a few marking lights and one sign panel. The record-breaking storm did, however, leave a significant dent in the airport’s annual supplies of sand, liquid deicer and salt. It also socked the maintenance budget with lots of overtime charges. Economic hits notwithstanding, Doughty says the overtime pay is a sign of the teamwork that was required to get the airport through a very difficult situation. Everyone at the airport played a role in getting operations up and running by Dec. 27, he notes. Airport police officers drove snow equipment; airline personnel worked alongside airport crews to dig out their planes; and rental car companies stayed open despite the conditions to provide stranded passengers with transportation. “This is typical of small airports—everybody knows everybody, so we can get everyone where they want to go as soon as we can,” Doughty comments. The lone hiccup ERI encountered was working with FAA’s new Runway Condition Assessment Matrix (RCAM), which was rolled out in October 2016. RCAM ties the type of weather contaminants to specific aircraft manufacturers braking performance data and standardizes the method for determining and reporting surface conditions. Unfortunately, RCAM was down for maintenance during ERI’s monster snowfall, and airport personnel were forced to call FAA Flight Service multiple times. This expanded what should have been a 10-minute process to almost a half-hour, depending on what the issue was and how long it took to be resolved, explains Banister. Snow storage was another challenge. Between the 63 inches of snow that fell around Christmas and the additional 2 feet that followed on New Year’s Eve, finding space for snow piles was a lingering concern. In fact, ERI had to keep some taxiways and other areas closed due to lack of storage space for all the snow.